While the holidays offer opportunities for togetherness and fun, they can also bring challenges that affect physical and emotional health. 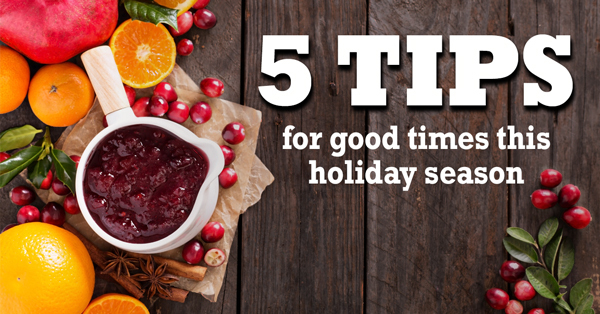 Below are five general tips for facilitating everyone’s good health and happiness this season. Make sure you’re up-to-date on vaccinations. If you haven’t already, why not schedule a visit with your SoFHA physician to find out what vaccinations you need based on age, travel plans, and your medical and family health histories. Remember: You need a flu shot annually, since different strains of viruses appear each year. Avoid touching your face and always wash your hands after using restrooms and before eating. You can lower your risk of being infected with any kind of nasty germ simply by not touching your eyes, nose and mouth, particularly when around commonly touched objects, such as doorknobs at rest stop areas or armrests on planes. When hand-washing, rub hands together using soap and clean running water for at least 20 seconds. Apply an alcohol-based hand sanitizer if soap and water aren’t available. Make a point of keeping up normal, health maintenance habits during the holidays. That is, eat well, maintain your usual exercise routine (if you can) and get plenty of sleep. It’s common to pack on 5-10 pounds during the season, so choose your foods wisely. In particular, be wary of liquid calories, including alcoholic beverages. Also, don’t let traveling odd hours or family reunions lead to sleep deprivation. Aim for getting six to nine hours each night. Drink lots of water – particularly before, during and after traveling. Water helps strengthen the immune system by transporting oxygen to cells, moving nutrients to our tissues and organs, and flushing out toxic impurities. In particular, choose to drink water over alcoholic beverages and caffeinated drinks on airplanes, as airplane air is dry enough to dehydrate even without the intake of alcohol. Try to drink from eight to ten glasses of water daily. Monitor your stress level and do things to stay relaxed and happy. Try to anticipate sources of stress and develop a plan for managing them. For example, if spending too much on gifts each year is a problem, develop a budget and stick to it. If parties make you anxious, cut down on the number you commit to this year. For yet a different version of tips for staying healthy this season, review “Holiday Health and Safety Tips” provided online by the Centers for Disease Control and Prevention.